SPHS Band Boosters is a 501(c)(3) nonprofit organization. Donations are tax deductible. Donations and sponsor support help us to pay for instrument repairs, instruction, music, drill, transportation, and other costs associated with running a high school band program. Funds and budgets also are established to enable students to participate who might otherwise be unable to afford to do so. For more information and ideas how you can help support the band, please contact the Band Director or Band Boosters Vice President Joe O'Connor at sphsbandboosters@gmail.com. For sponsorships of $1000 or more, please use the download form linked below and remit a check. ​For sponsorships of $500 or less, use the form and remit a check, or we can accept online Paypal too. * Logo artwork must be received electronically by close of business on August 5 to be included on marching band shirts, drawstring backpacks, and banners. Please send print-ready logos as file attachments or links to sphsbandboosters@gmail.com. 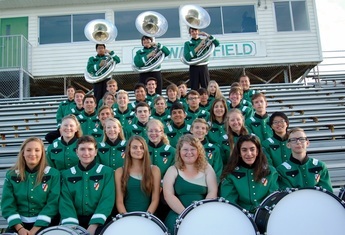 In addition to supporting the band as sponsors, there are other financial and non-financial ways that members of the St. Petersburg community can support SPHS Green Devil Bands.